Teens nowadays will do anything to emulate their favorite pop stars, but a 16-year-old from Baltimore is learning that imitation is not always the best form of flattery. "I was like, 'Oh my god, I love this outfit, I wanna go with this outfit. Let me go show my mom,' and I was like, 'Mom, Mom, Mom, I wanna wear this, it's cool, I love it, oh my god,” Alexis told Fox Baltimore. To make matters worse, Alexis was even clowned by the one person she was trying to emulate, the Bajan pop star herself. The singer posted photos of both outfits on Twitter, accompanied by a sad face. She also put a photo of Alexis' outfit next to a Wu-Tang Clan symbol. Although some people would be flattered that Rihanna had acknowledged that they even exist, Alexis didn't find the mocking funny. "I was very offended," she said of Rihanna's tweets. "Why throw shade on it when you had on the exact same thing? The poses was different, but the outfit wasn't." Now Alexis says that she's afraid to show her face, and the cyberbullying hasn't stopped. She's also thinking twice about the person she admired: "She don't love her fans like she says she does." One has to wonder who Alexis will try to imitate at next year's prom. 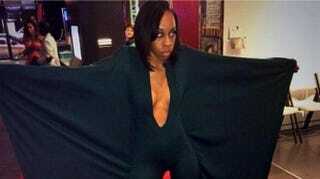 Or has she put away her bat suit for good?